All transactions are safe and secure with a reliable history in online purchasing behind each of our associates. 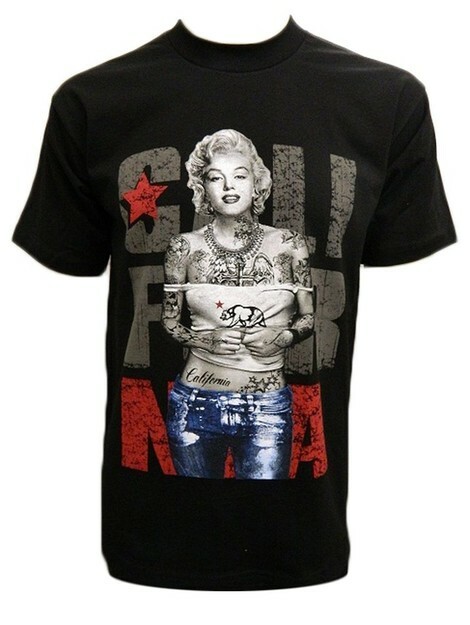 Buy the Marilyn Monroe Star t-shirt to own Marilyn Monroe clothing and merchandise. This California Marilyn t-shirt seems to say, "We are all of us stars and we deserve to twinkle." Not only is she tattooed with stars, she is shining as only she can. Check out a Marilyn Monroe book to read more of her words of wisdom. She may have played the helpless dumb blonde on screen and off but she was far from it. She did make it seem like blondes have more fun though! In addition to the Marilyn Monroe Star tee above, browse the Marilyn Monroe Clothing Gallery for more apparel like men's and women's clothes, kids shirts or hoodies.